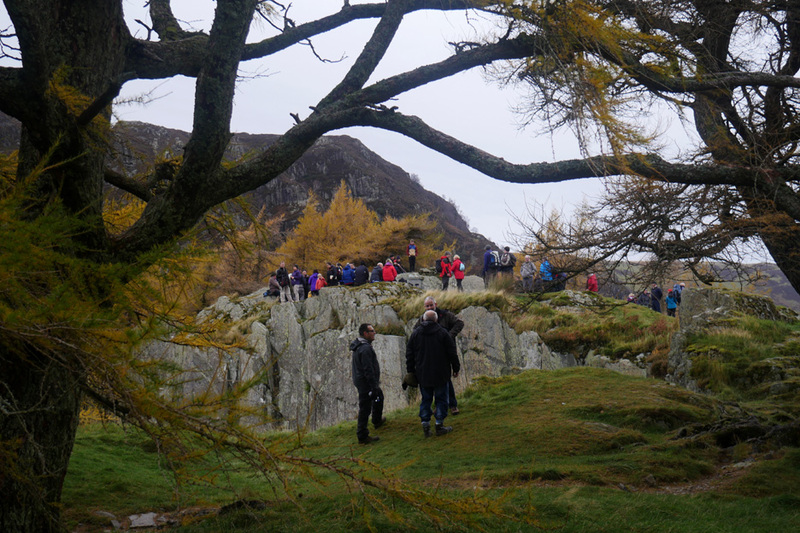 " Remembrance at Castle Crag 2016 "
Date & start time: Sunday 13th November 2016, 9.15 am start. 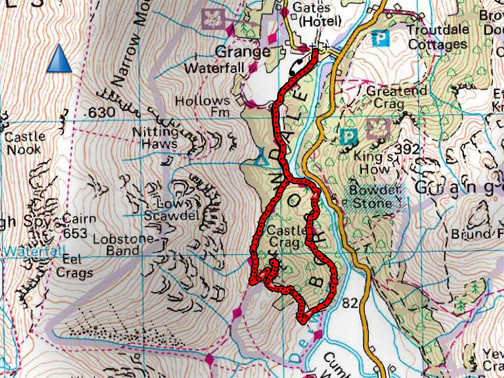 Places visited : Grange, Broadslack Gill, Castle Crag returning via the riverside. 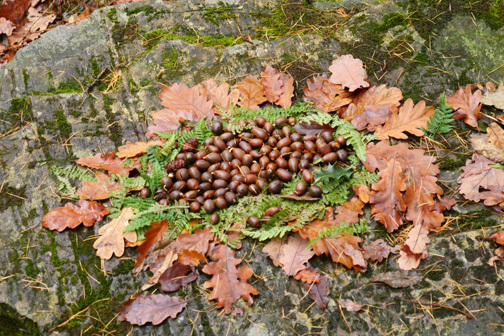 Walk details : 3.9 mls, 850 feet of ascent, 4 hour 15 mins including the ceremony. 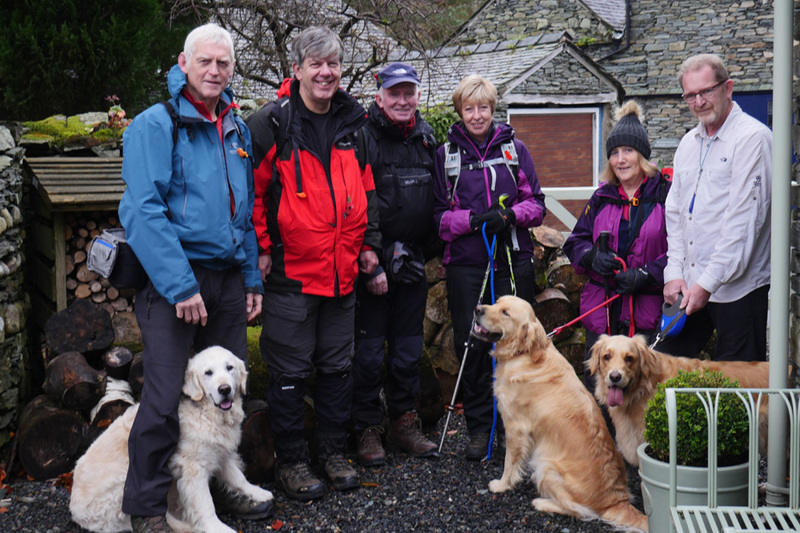 Walked with : Sherran and Bill, Neil, Ann and our dogs, Harry and Dylan. Weather : Overcast but dry though there were showers about after 11am. 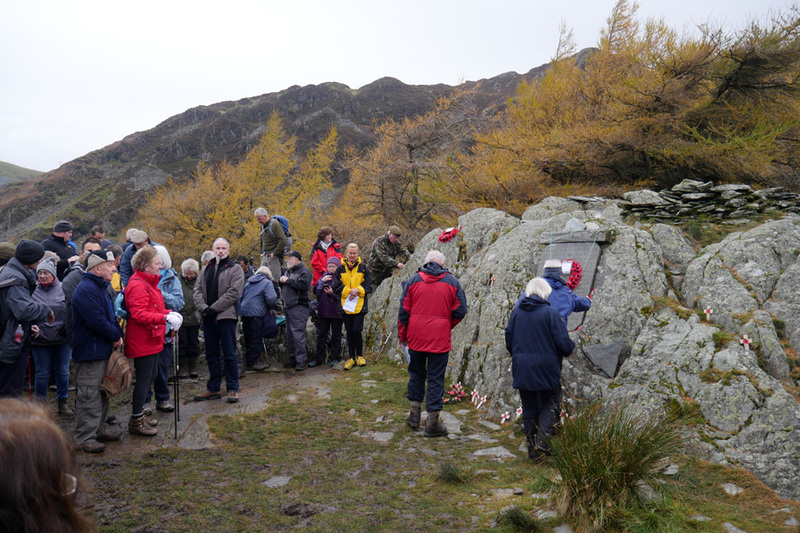 On Sunday we joined approximately 200 others on a walk to the War Memorial on Castle Crag on Remembrance Sunday. 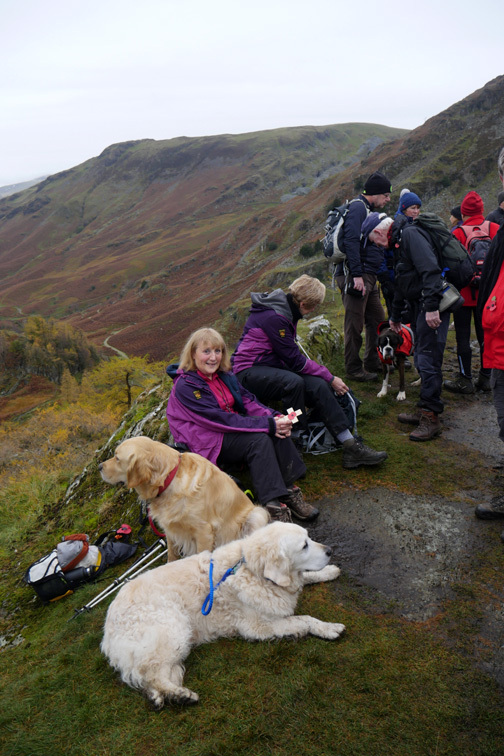 People travelled from all directions and met on the summit at 11am, including our group of 5 who started from Grange. but did kindly offer a parking space outside their home. 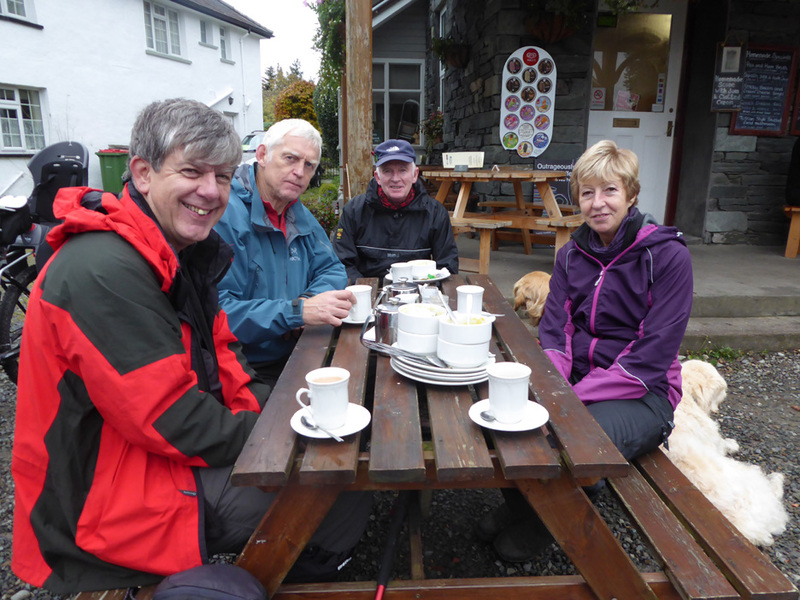 Neil, Sherran and Bill are in the centre in this picture kindly taken by Gill. We're down here, passing this and going there . . . sums up the route I think ! 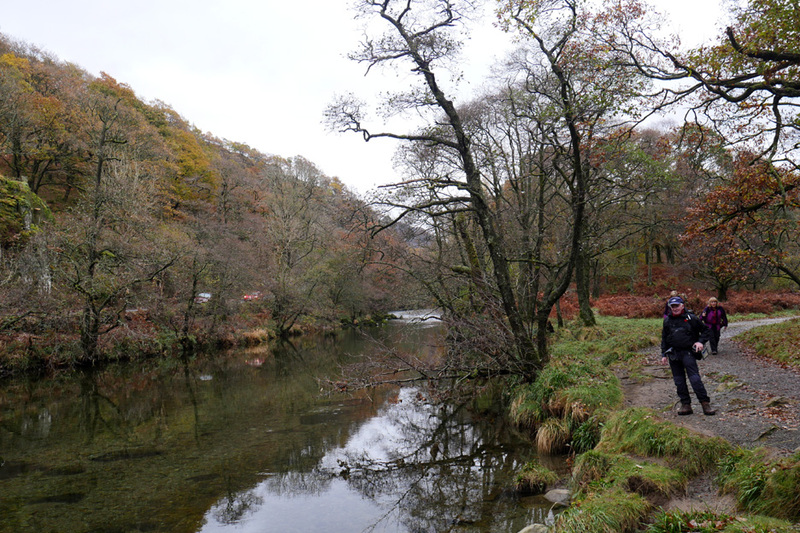 The track alongside Hollows Farm campsite passes close to the summer picnic spot on the River Derwent. The stream coming in from the right has brought down a lot of stone, but it is always possible to cross the stream by a bridge. 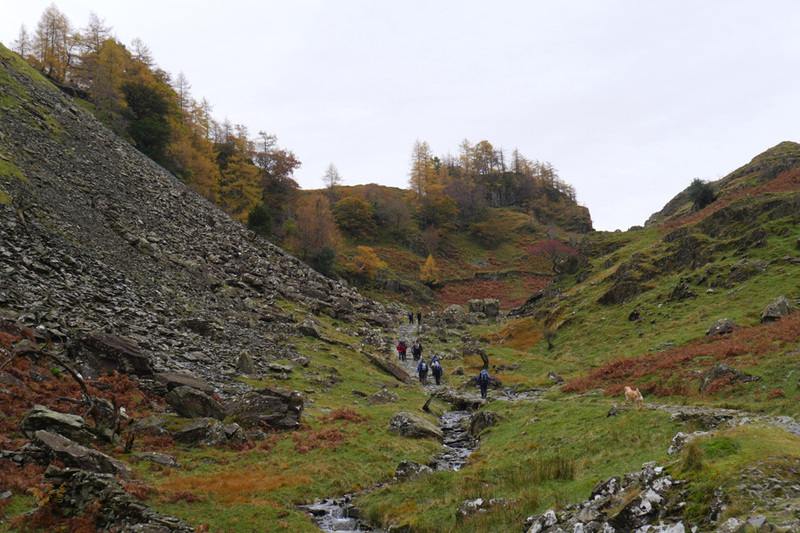 The valley up between Castle Crag and High Spy is known as Broadslack Gill valley. 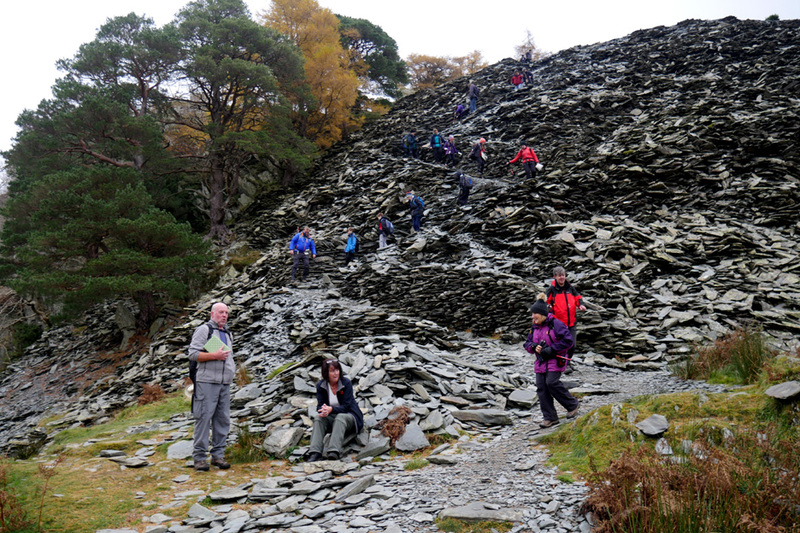 It is better known for the old high level valley road that brought down slate from Honister Mine in times past. 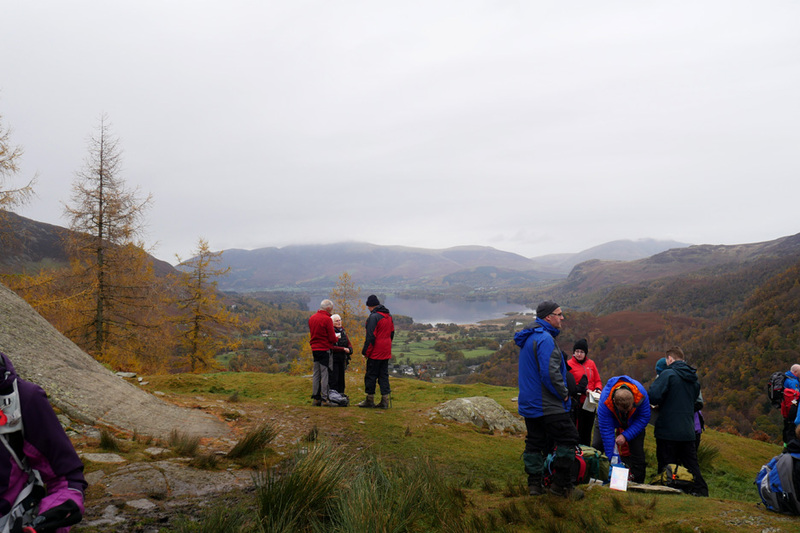 The valley is also renowned for the view back to Derwent Water and the Skiddaw Fells behind. 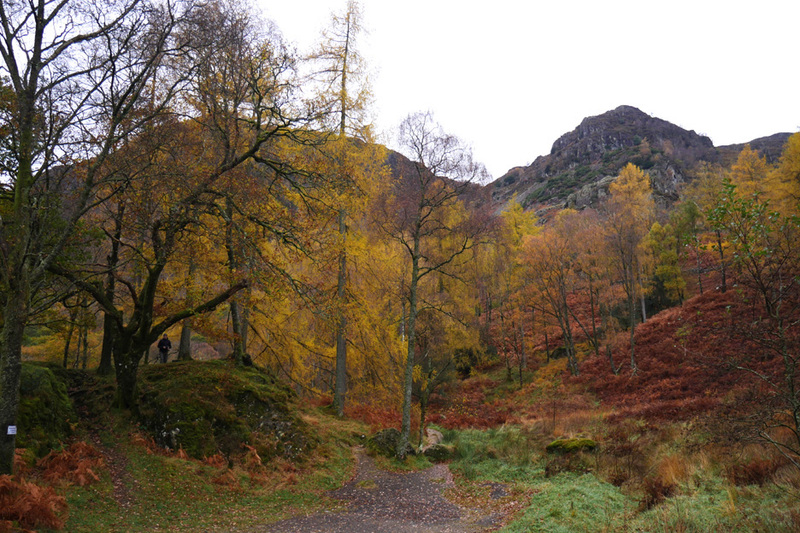 Unfortunately the trees are growing taller and starting to obscure the view, as they do at Ashness Bridge. 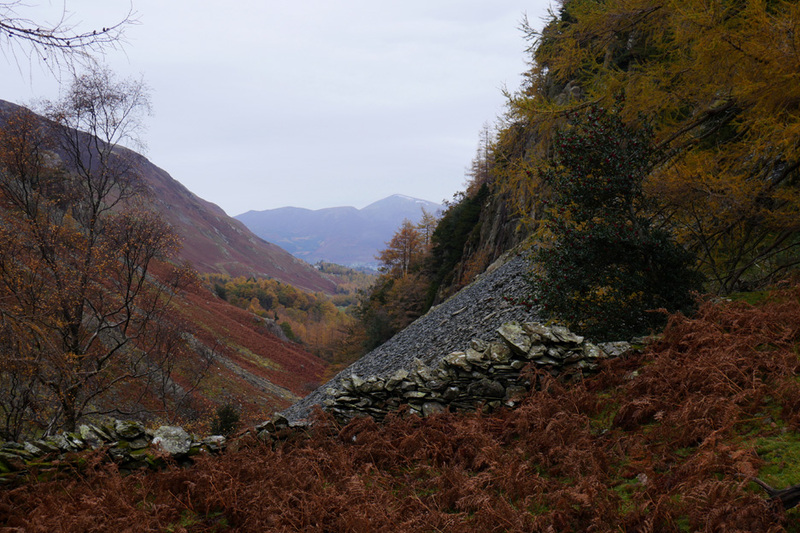 The scree slopes are waste slate from the Castle Crag slate quarry high up on the left. Skiddaw again showing a residual cornice of snow from last week . 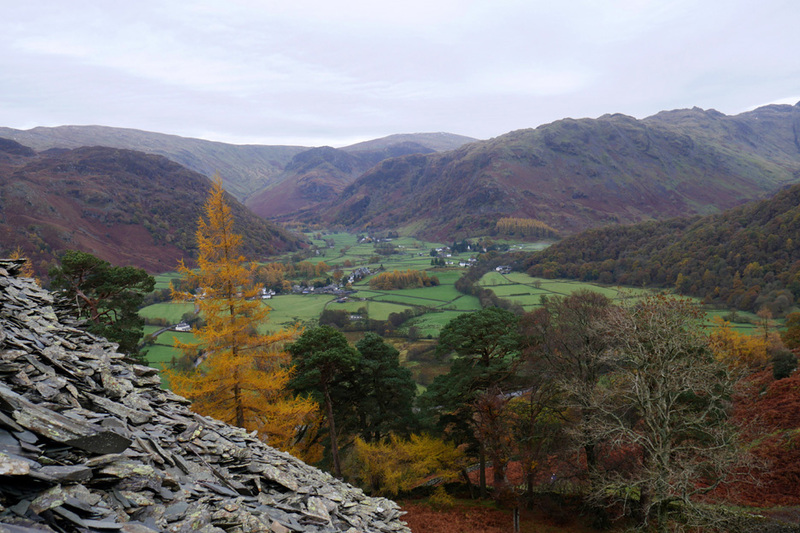 . . the first Lake District snow fell this year on November 5th. 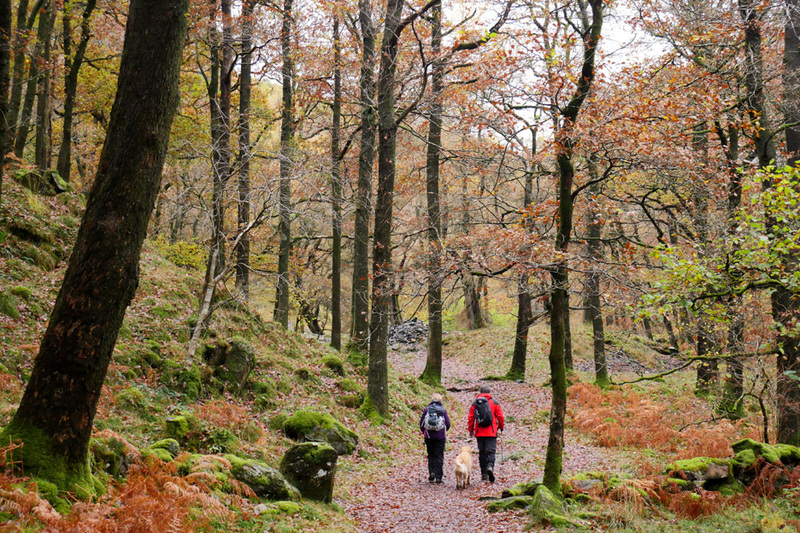 The girls take Harry on the lower path through the trees. 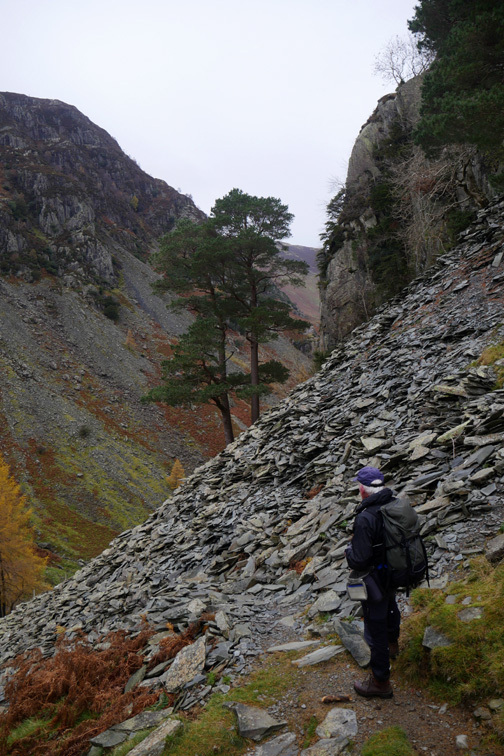 Bill and I climbed the short, open track across the scree. 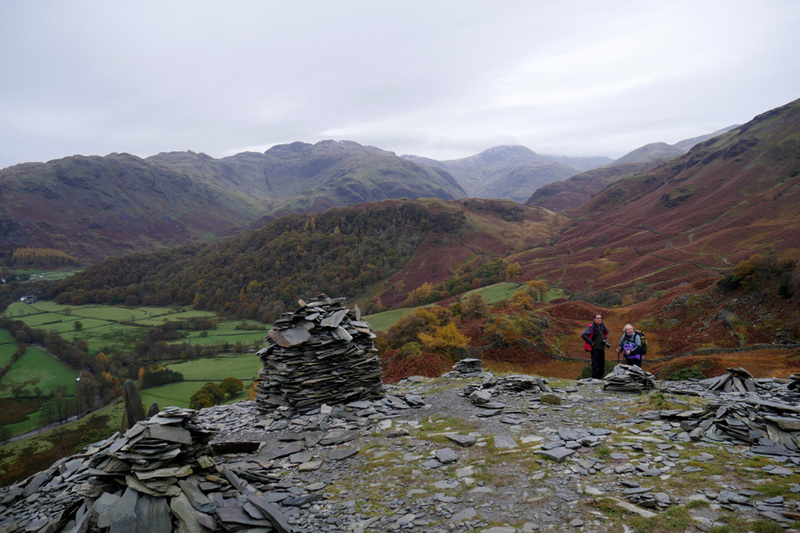 A spiral round the back of the summit and we are climbing the zig-zag path that ascends the last section of this lovely fell. 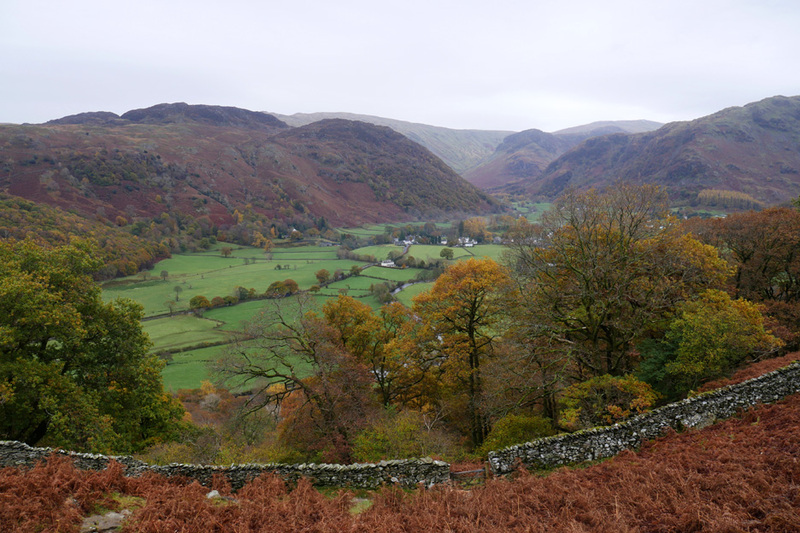 Below is the valley of Upper Borrowdale with Rosthwaite and Eagle Crag in the distance. 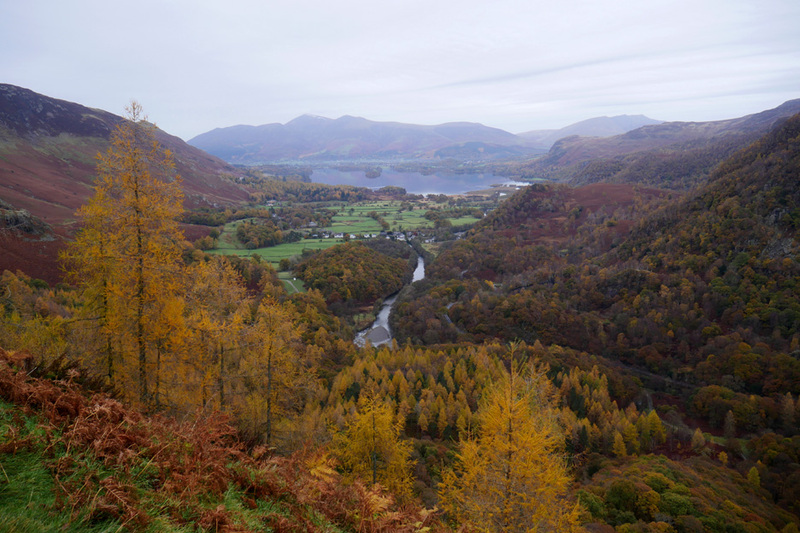 Bright autumnal colours on the larch and now we can see that full view of Derwent Water. 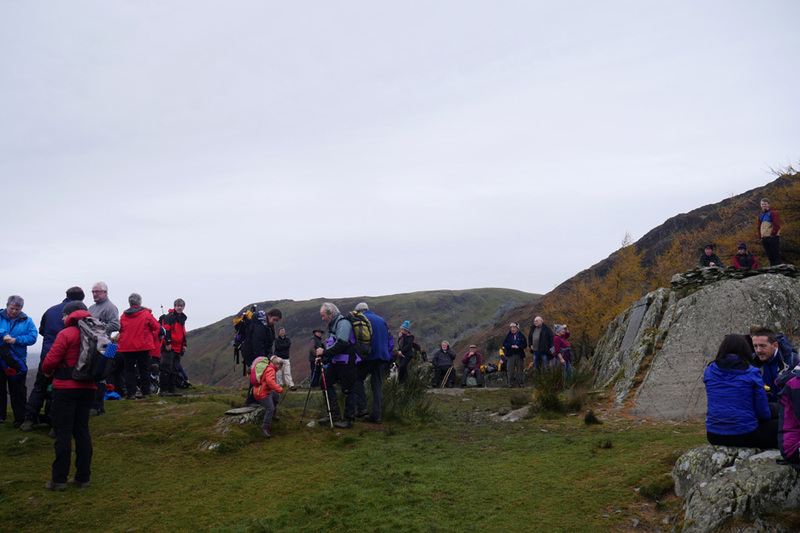 There is already a crowd gathering on the summit crag. 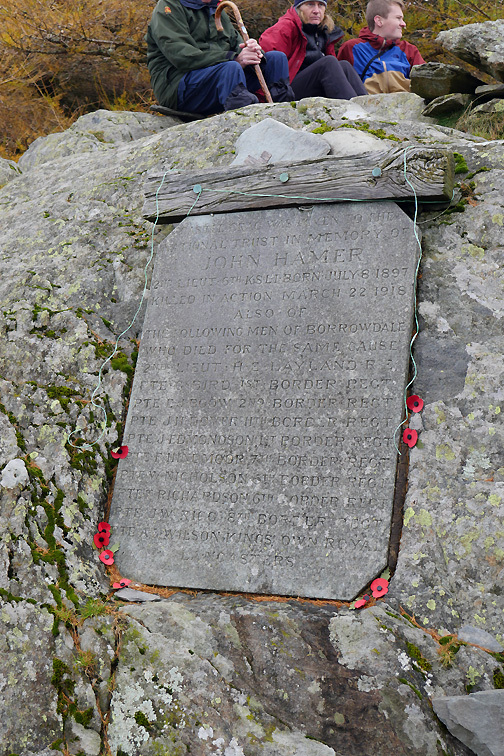 The war memorial, to those men of the valley who died in the First World War, is mounted on the rock to the right. 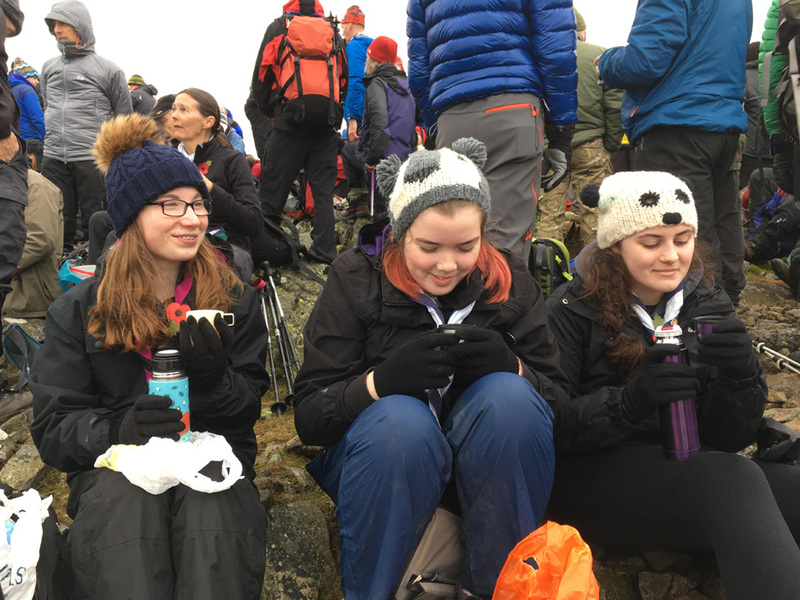 in order to keep warm after the climb. for Neil's photo of our small group. 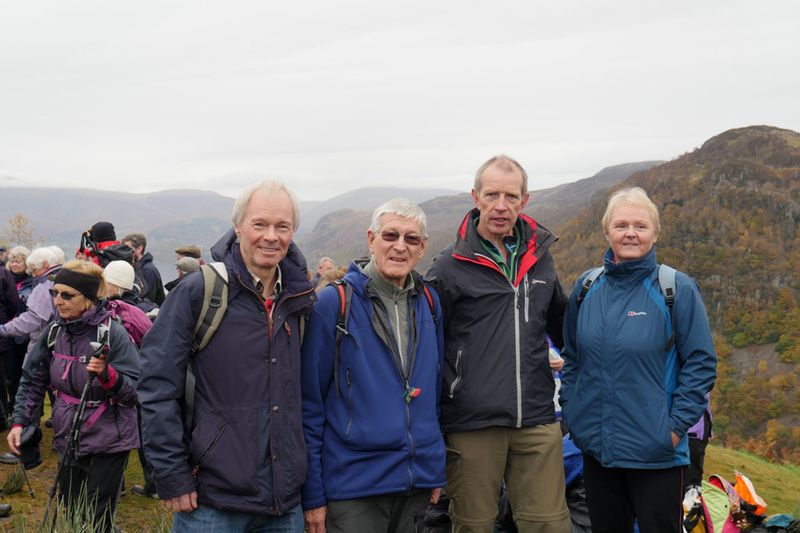 We had arranged to see Syd Cornwell on the summit. 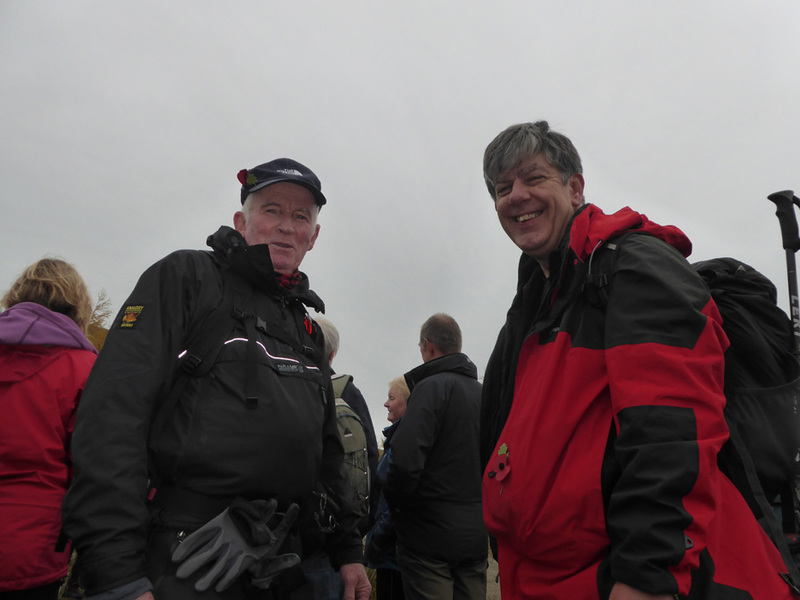 Due to ill health last year he couldn't make the climb so on that occasion I carried up his Remembrance poppies. This year he made it himself and so was able to lay his own Remembrance dedications. 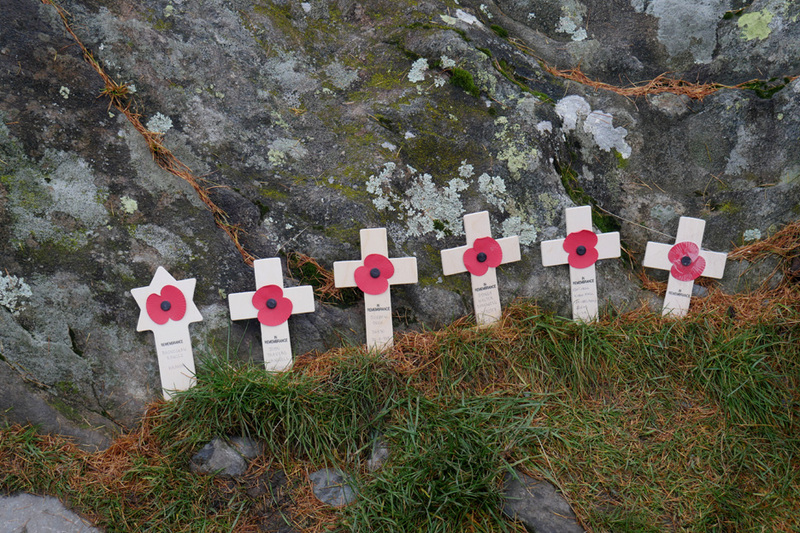 The crosses represent his family members and a Jewish family friend who died in the Second World War. An extra one this year to Joseph W Beck of Loweswater. 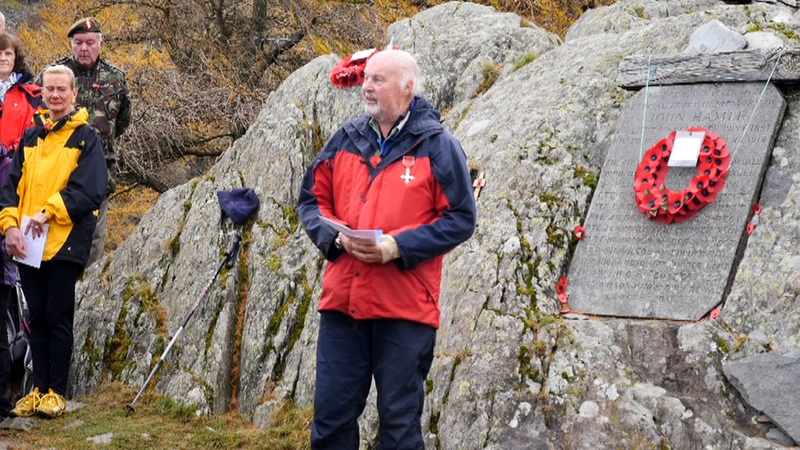 and discovered that Joseph Beck, the son of the pre-war Loweswater blacksmith also died in the war. 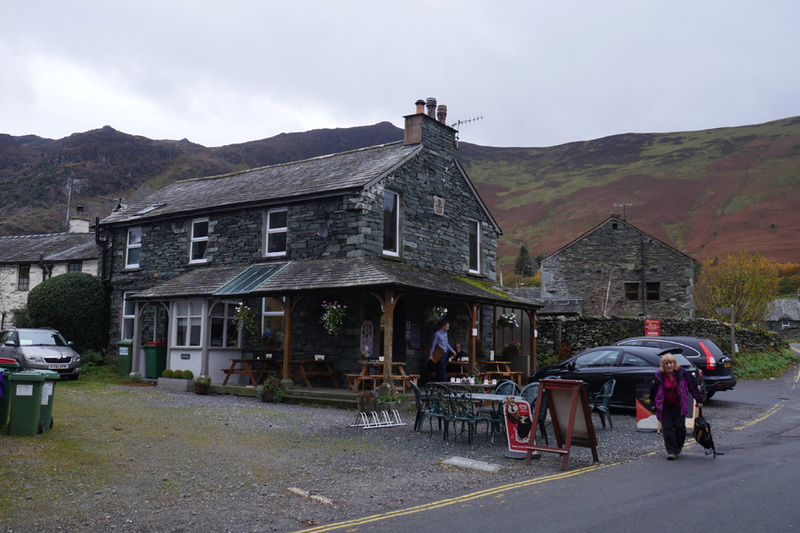 Our cottage used to be known as Smithy Cottage and the triangle of gravel opposite was the site of the Loweswater Smithy itself. the day is also dedicated to all those that have died or been injured in service of their country since that time. 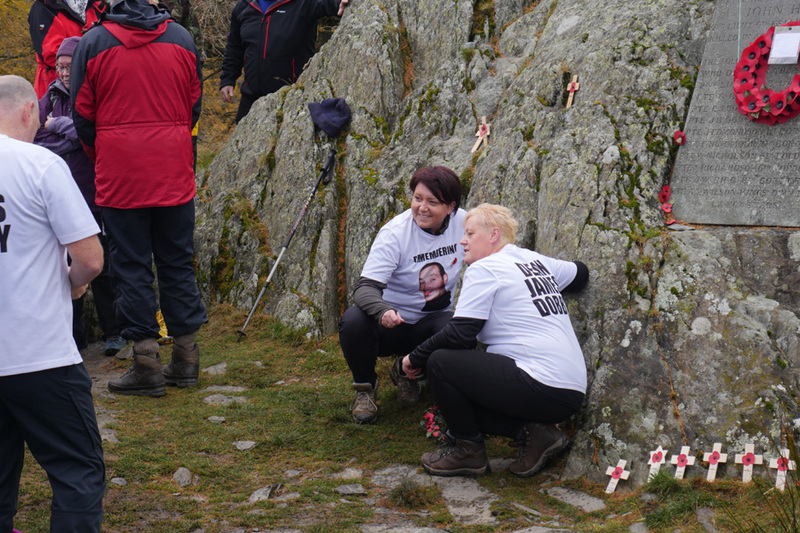 Here a family group remember Dean Dobbie who died relatively recently in Afghanistan. Before the service I climbed to the summit for a wider view. There are about 150 or more people here, possibly two hundred counting those not in the photo. 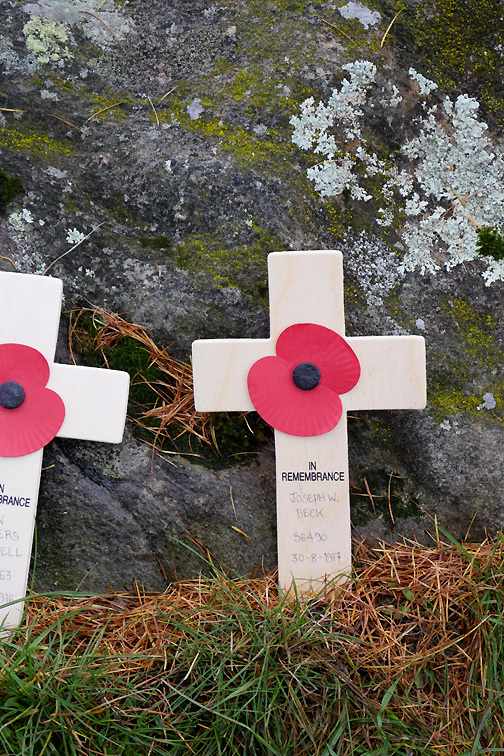 Final wreaths and poppies were placed before the start of proceedings. 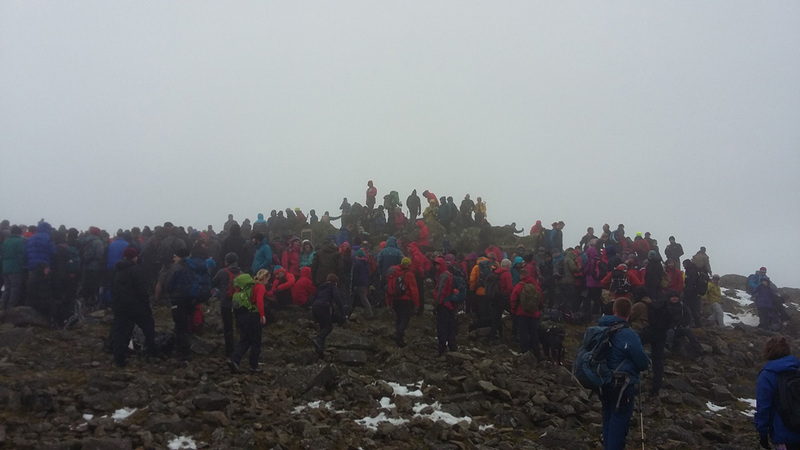 in much more pleasant weather conditions than last year, when it was raining heavily. 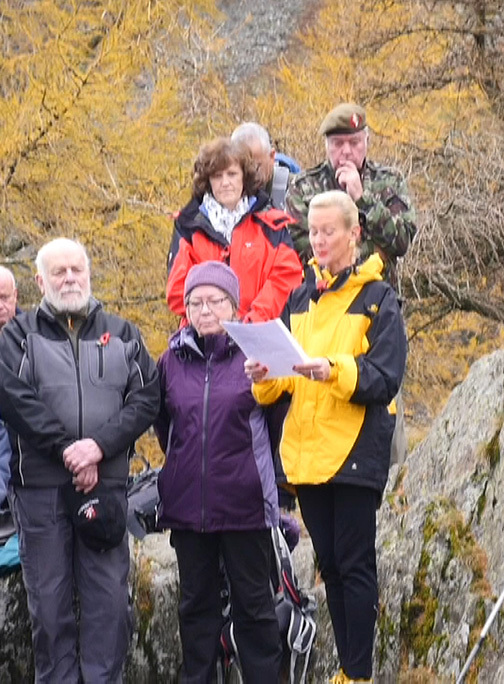 mentioned those who have died in more recent conflicts and offered up a prayer before the two minute silence. He didn't know the world's askew. Our rifles ready on our knees. And right be wrong, and laughter tears? The murder of our fellow man. Sweeter than that bird's song. Afterwards a war poem, the Listening Post, was read by Margaret Braithwaite. After the ceremony was over we had time to stay and chat to friends and acquaintances. 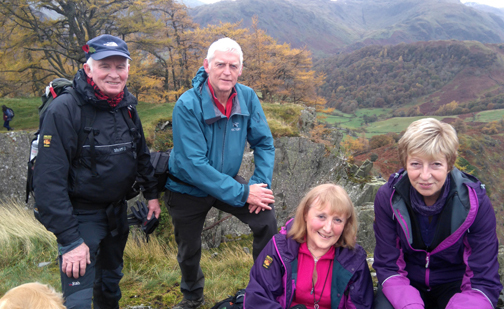 Here were Eric and Liz from Norfolk with their friends Richard and Janet. Mike and Barbara and friends (sorry no names). These two you already know . . . Bill and Neil. 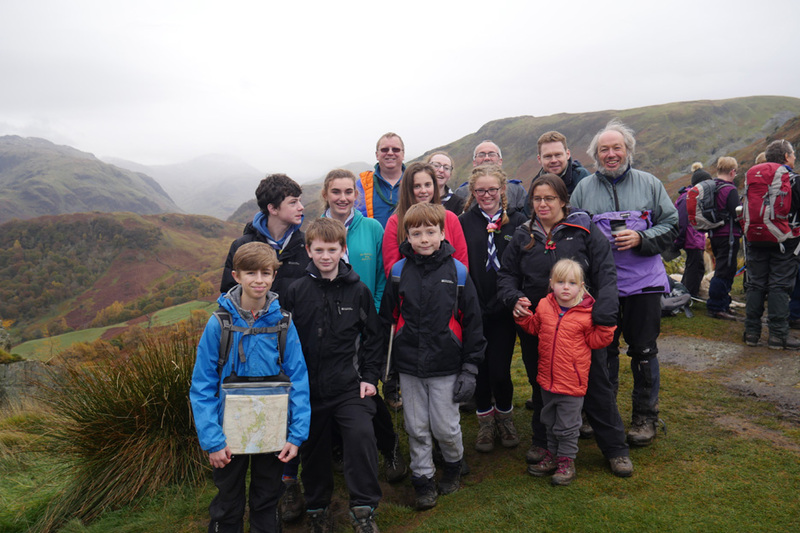 A contingent from the 16th Harrogate Scout group . 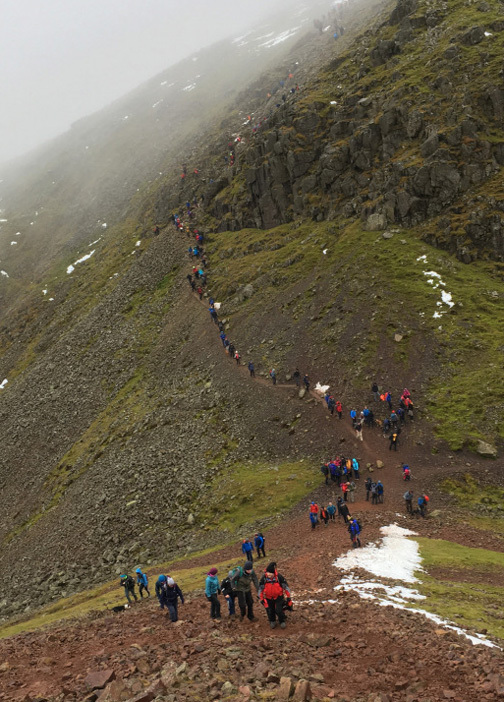 . . others of their group have climbed Great Gable today. The full group . . . by the look of the weather behind, their friends will be a little colder and wetter ! Time to be heading down . . . The small cairn that was here for a while seems to have grown to a mini-shelter. I think the builders lost the plot somewhere near the final cap stones . . . either that or the strong winds have dislodged the slates. 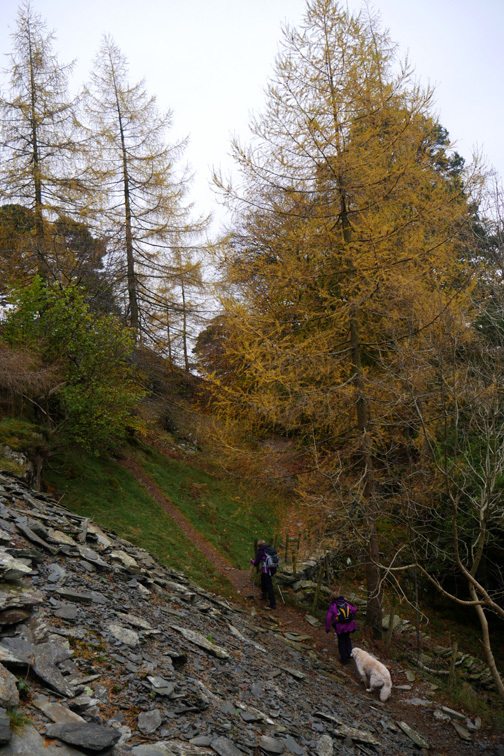 Lovely coloured larch to look at as we stop to allow others to pass. 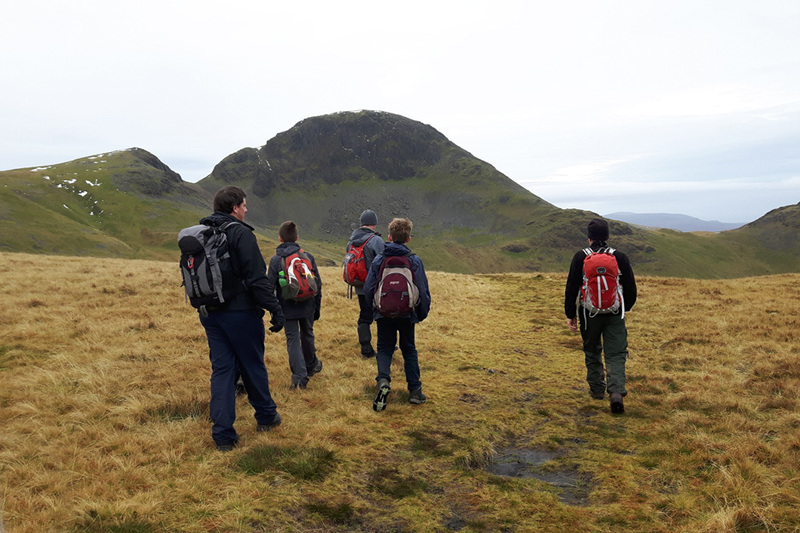 Another group of youngsters makes for the summit . . . Dylan greets them all. 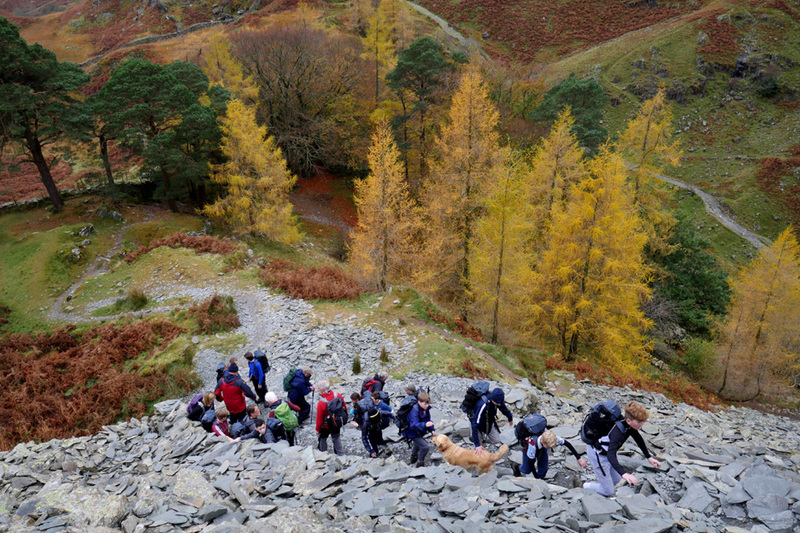 Coloured jackets of the walkers outline the way up and down the slate path. 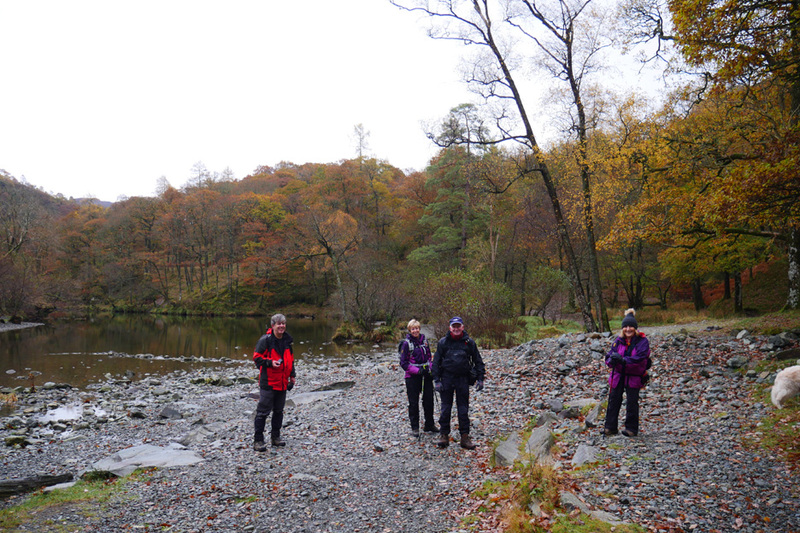 We cross the ladder stile and head down in the direction of the river. 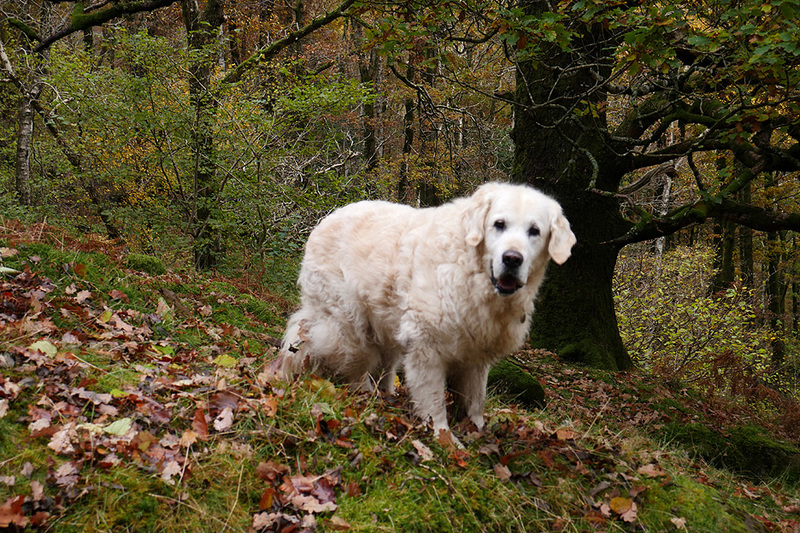 Harry prefers the softer grass rather than the pitched stones, so he walks down alongside the path. Back through High How Woods . . . the colours of the trees are superb today. 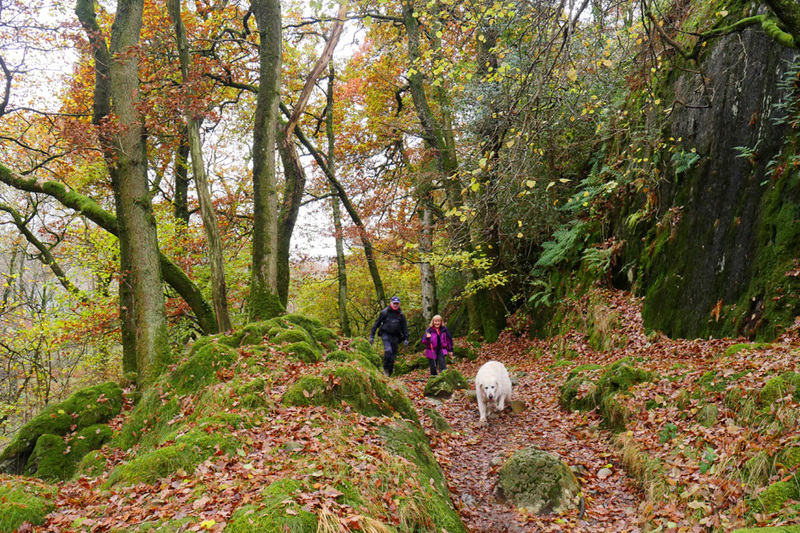 Neil and Sherran walk ahead on the leaf covered path. Beautiful reflections in the pools on the river. 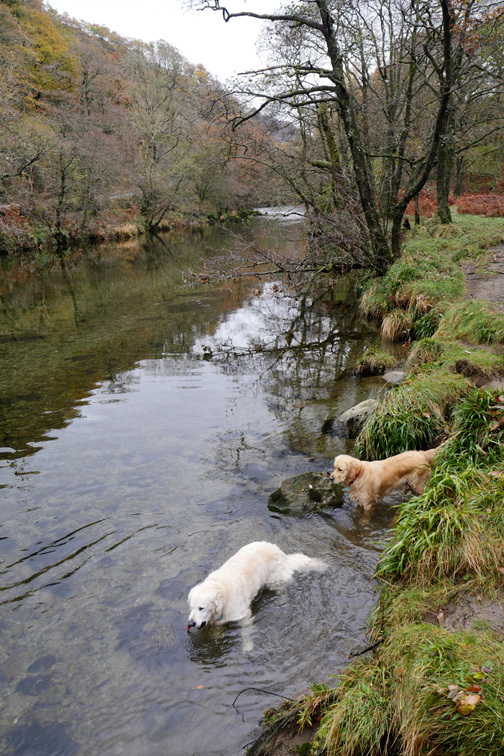 The water is clear and you can see every pebble on the river bed. Well you could until they broke the spell ! Almost a full circle back to the small foot bridges. 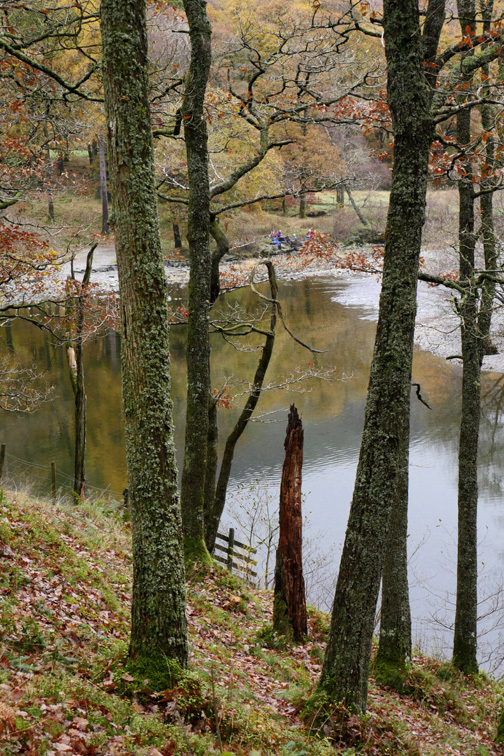 Looking downstream at the large pool. and not an Arts Council grant in sight ! 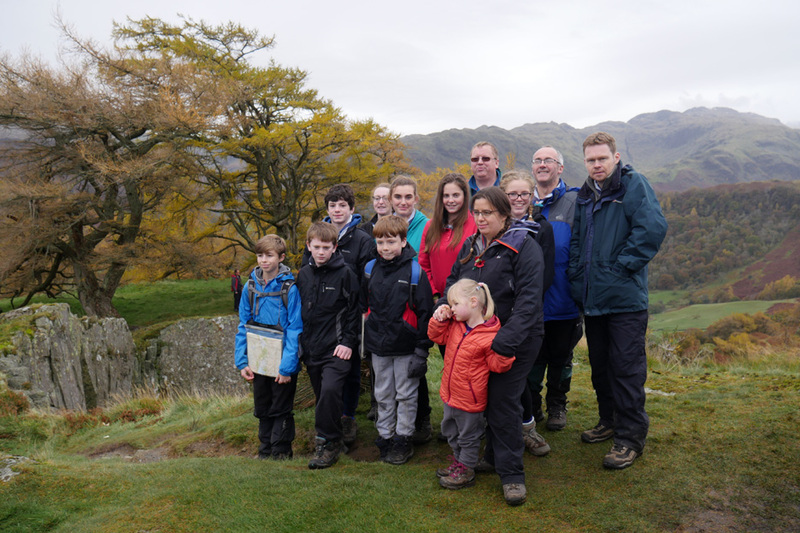 Retracing our steps along the path to Hollows Farm . . . looking up at Nitting Haws. 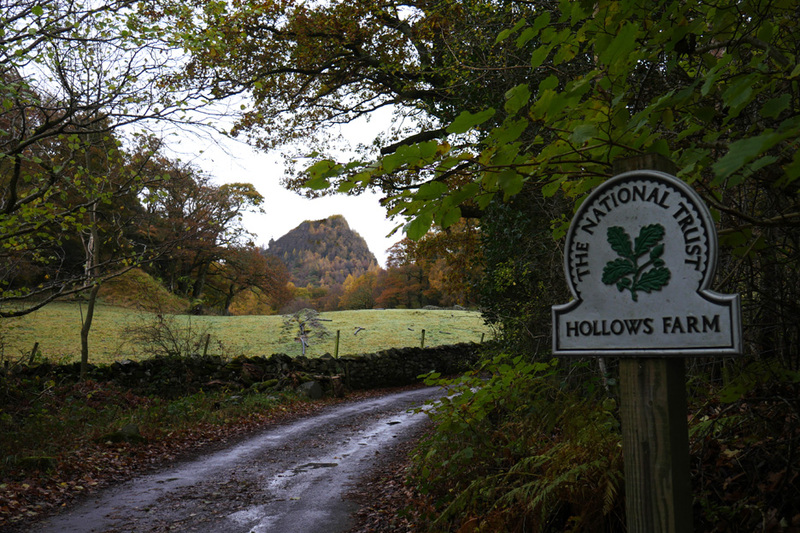 The road to Hollows Farm starts alongside the second cafe in the village. Conveniently, if you back-track, it ends up there as well . . .
but as it happens, we'd eaten it all up before the camera was remembered. 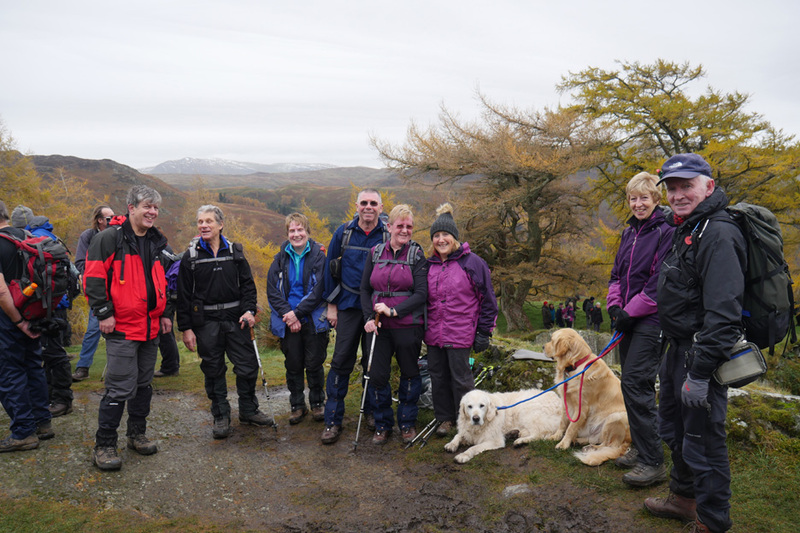 Thanks to everyone for a nice walk once again. 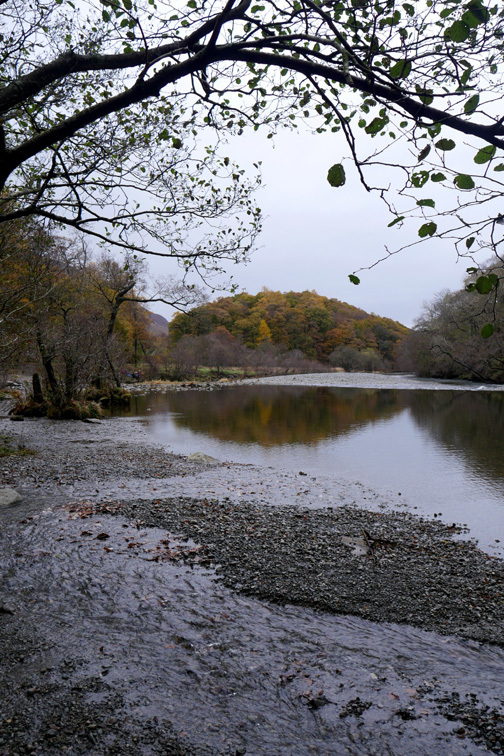 Loweswatercam viewer Mike Higlett wrote to me in advance of the weekend and said he would be up in the Lakes. 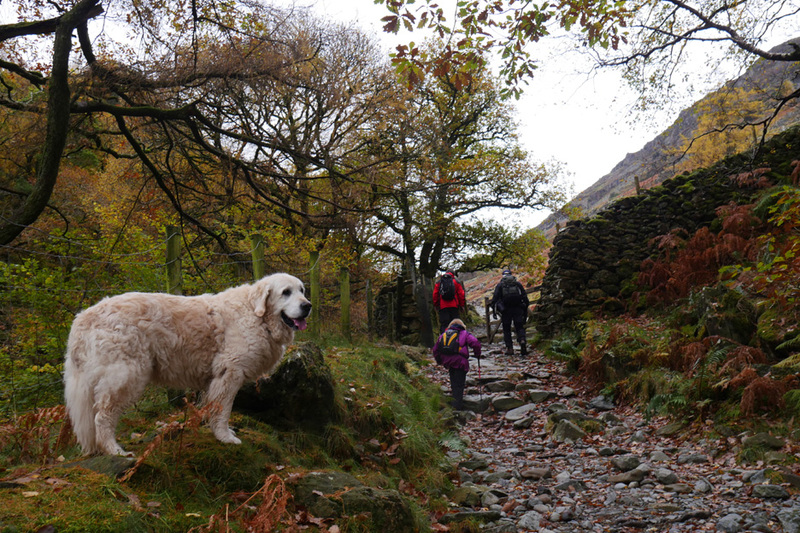 and he would be leading one of three groups up to Gable. 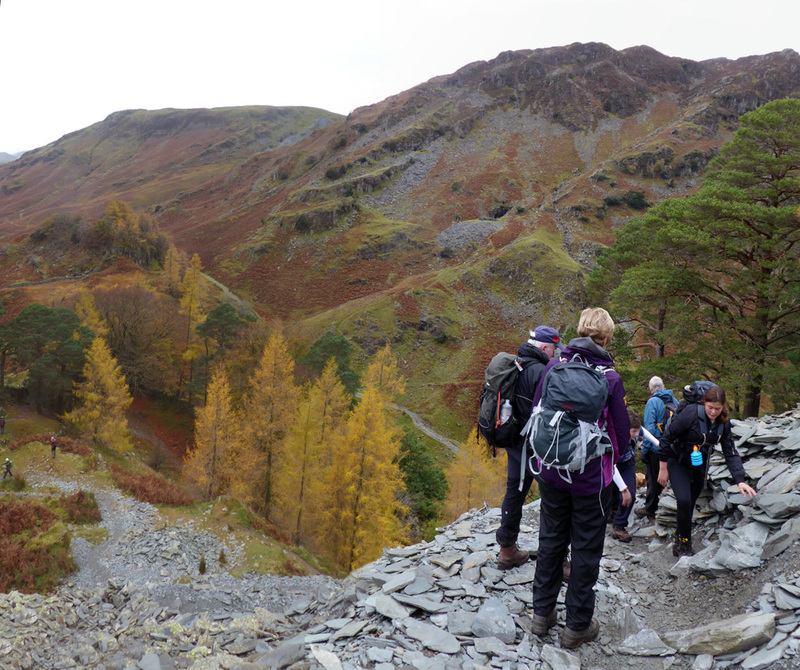 A fourth group (which we met) were headed for Castle Crag. He would send me a picture or two.
" 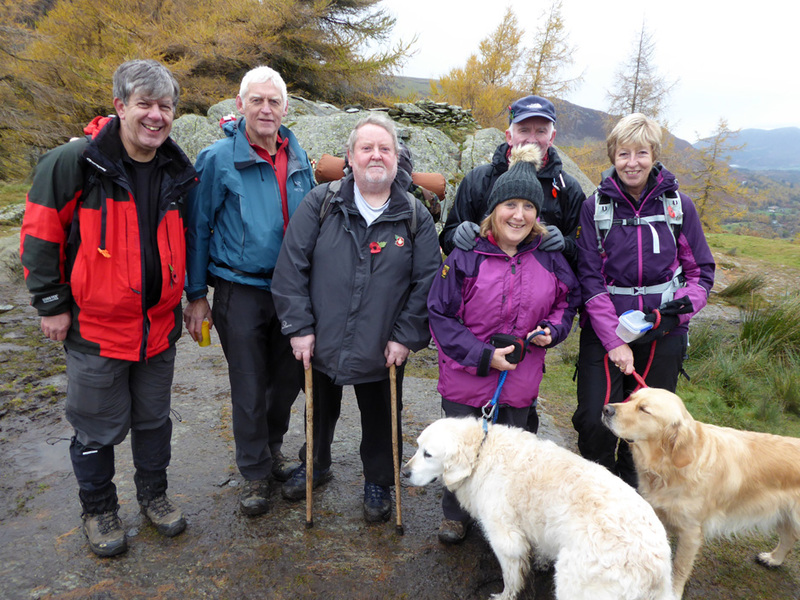 Moses Trodd - this is my group looking at Gable as we joined onto Moses Trod"
Gable Summit - always a popular place on Remembrance Sunday. 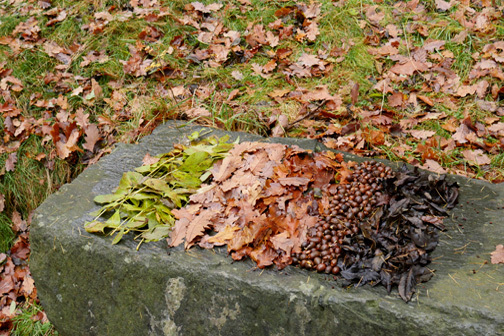 where they were died and where they are now buried. As the silence finished a lone bugler played the last post, followed by a pause, then reveille. 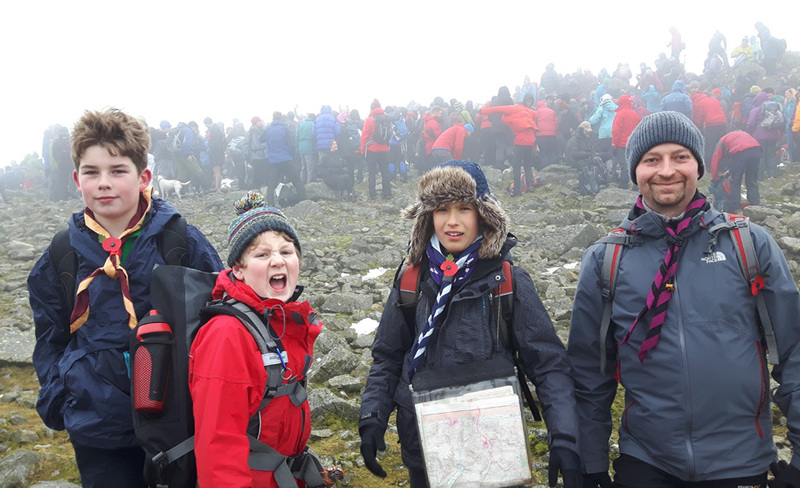 Will's group at the summit . . . the girl sat at the right hand end is my (Mike's) daughter. 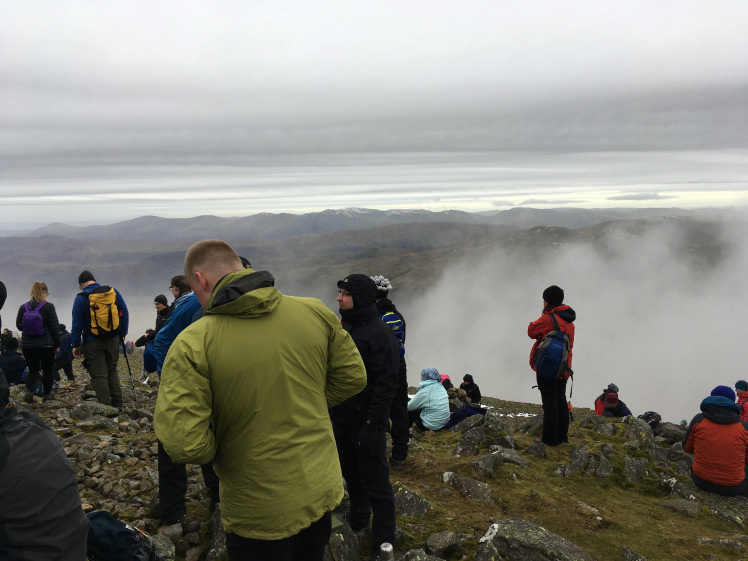 When the service was finished we didn't stay around too long, as the cloud was coming in and the temperature was dropping. 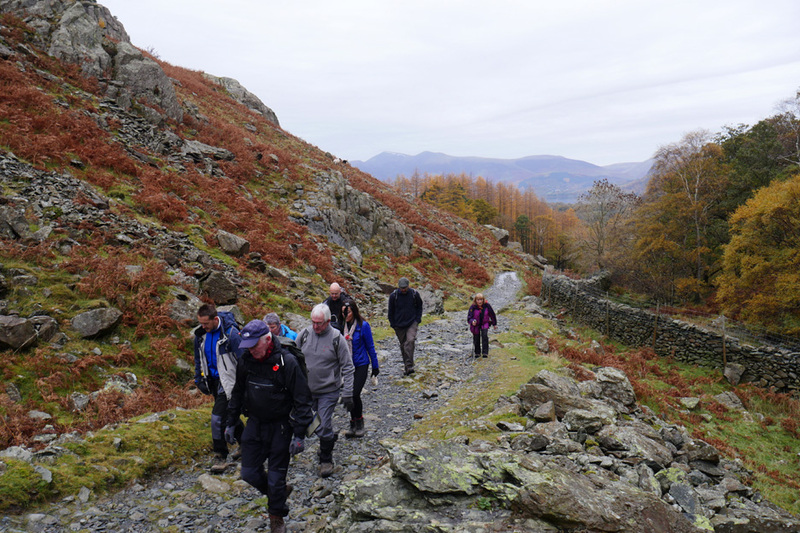 We joined the queue to descend via Windy Gap, to then cross Green Gable before rejoining the path back to Drum House and Honister. We finished back at the cars at 13:50. These were the photos of his uncles that were mentioned on the crosses of Remembrance that Syd Cornwell took up this year. 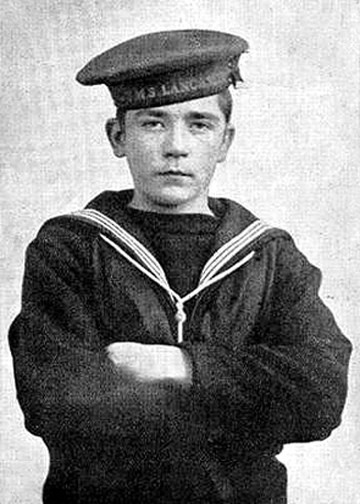 Uncle John, the sailor, (known in the family as John Travers) was only 16 when he died. He was badly wounded at the Battle of Jutland on 31st May 1916 and died in hospital in Grimsby two days later. 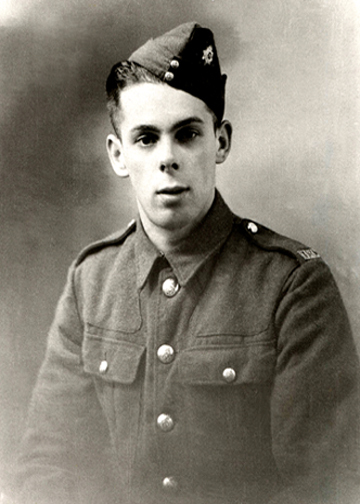 He received a posthumous VC and is buried in Manor Park, Ilford, his home ground. Uncle Syd was 25 and married. He died in Tunis and is buried in the Commonwealth War Cemetery at Medjez-el-Bab, 40 miles to the west. I’ve been fortunate enough to have been able to visit both of their graves. Technical note: Pictures taken with either Ann's new Panasonic Lumix TZ60, or my Panasonic Lumix Gx8a Compact System Camera. This site best viewed with . . . time to appreciate what it all means.